Happy Friday! This week has flown by – I also can’t believe it’s almost the end of the month. 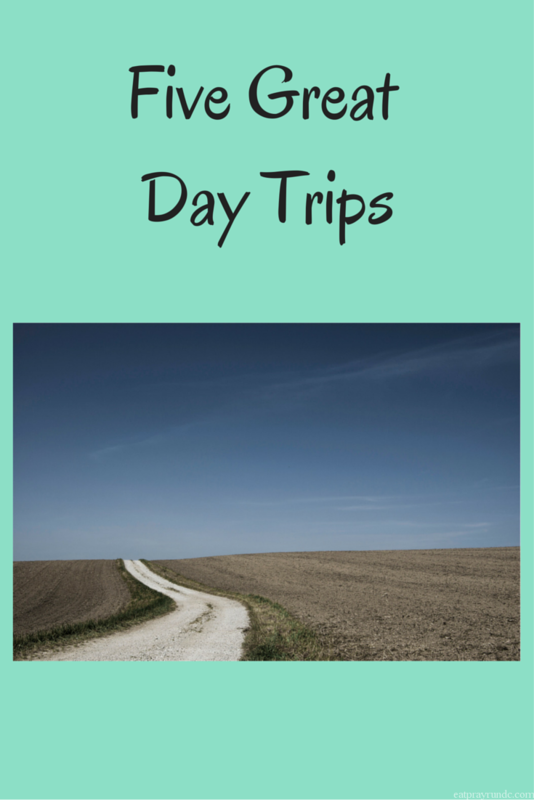 This is a free Friday, so I’m sharing five great day trips. Some of these I’ve taken and others I have not. All of them are in the DC metro area, because that’s where I live. 🙂 Hope y’all have an excellent weekend! Stay safe in the heat – this weekend is supposed to be a bit…rough! Don’t forget to check out Cynthia and Mar and some of the other folks who link up with us – and please don’t forget to link to your hosts if you are participating! Annapolis, MD. Annapolis is an easy drive from DC and so cute. Downtown is all adorable cobblestone and fun restaurants (hello, delicious seafood) and it’s also very pet friendly, which is a total win in my book. Leesburg, VA. Wine tasting!!! That’s what I think of when I think of Leesburg. Oh and outlets. Because those are great as well. Charles Town, W VA. This is where we spent our anniversary weekend last year and it was awesome. Also this distillery is amazing. That alone is worth the (short) drive in my opinion! Baltimore, MD. A short drive and tons of fun stuff to do in the Inner Harbor area and Fells Point. Hubs is also from there, but ironically we never go outside of visiting family. Are you big on day trips? I really like them if they aren’t too far – 90 minutes is really my limit, I think. I’ve been doing a lot of day trips lately. It’s amazing to see so many new things that are fairly close by that I never knew. I always go through Leesburg Va when I drive home from Virginia to Pennsylvania and always have wanted to do some wine tasting but I know that is never a good option while driving long distance. Will have to go up sometime for that reason and make a day of it. Love going to wineries. We actually like day tripping it to DC! We live near Harrisburg, so it isn’t far. My hubby really wants to take me to Annapolis this year! Never forget Cville! Middleburg is another good day trip. Great trips! I need to check into some of those (but for me they’d actually be real trips lol). You’ve got so many great locations nearby! Things are a little more spread out here in the Midwest, but we do have a lot of places for day trips. Chicago, Lake Geneva, Galena, Starved Rock State Park, Milwaukee… just to name a few. My parents still live in Leesburg. There’s also a great wine kitchen and now a few breweries in the area! Sadly, 90 minutes from my apartment is still around DFW. It’s a big city. I loved doing day trips in New England though. We could go up to Vermont or down to Newport, or visit any of the wineries up there. It’s funny, I lived on the East Coast for 35 years and I haven’t been to some of those! I think Philly/Valley Forge is another good one – maybe a wee bit far from DC! The Chicago day trips are less exciting in my opinion, but Madison, Wisconsin and the lake towns in Michigan are quite nice! We loved taking day trips when we lived in the DC area and your post has brought back some great memories. We lived in Montgomery County and would drive the back roads through Poolesville and then take White’s Ferry to Leesburg. Such a beautiful drive. Frederick, MD for waking around and a minor league baseball game. There’s also Manassas/Bull Run if you’re into history. I love day tripping to Annapolis and Bmore! I love a good day trip and I agree, 90 minutes is about the furthest to still make it fun. I haven’t been on many this summer, but I always like going up to the Georgia mountains in the fall. wine tasting is always a great idea! i love day trips/weekend trips — i usually go upstate on the wknds but otherwise, we take beach day trips whenever we’re in the city during the summer. must.be.by.water! day trips for me would need to be like 3 hours away. in texas drive 90 minutes and you are still driving somewhere lol. san antonio, austin and dallas are all 3 hours from me and those are really fun day trips to take! I would really love to go to Blatimore and run a race there – I’ve only heard good things! Woohoo Bmore! I love Annapolis as a day trip but haven’t made it out to St. Michael’s yet. Those sound like fun trips. I have a few places we go for day trips – Galveston (for the beach) and Montgomery (for the cute downtown and shops)… need to come up with a few more, there are a lot of fun weekend drivable trips around here (places that are about 3 hours drive). These are great ideas. We don’t do too many day trips but you’ve nailed all the good ones! I had so much fun at the Inner Harbor a few weeks ago – I’d like to go back soon. My weekends are usually spent at home, not too many day trips. I travel so much for work that I prefer low key weekends. Great recommendations! We love Annapolis and the inner harbor too!